Have you ever stopped for a moment and been grateful for the body that you have been blessed with? Have you ever paused just to celebrate the chance to see a new day? If you are an average Jane like me, who leads a pretty normal life, then I am sure your answer to the aforementioned questions is going to be no. We humans seldom contemplate the fickle nature of life and remain oblivious to the imperative nature of death until we have a reason to believe that our days on this planet are numbered. And once that does happen, we rush to imbue our life with meaning, almost as a compulsion. Which is why I found myself pleasantly surprised when I heard the former actress Sonali Bendre Behl, talk about her brush with cancer in such a disarming way at a conclave held recently. 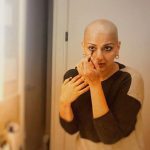 Choosing to open up about her experience with a tinge of self-doubt, Sonali explained that when she was invited to speak at a conclave, she thought to herself why or rather what would she talk about, since her brush with cancer was by no means a unique event, it had happened to hundreds of others. Neither was she a doctor or a psychiatrist, who could offer a unique perspective on the disease. It was this refreshing honesty of hers, that won me over. So what did she talk about? As it happened, she chose the moment to have a very honest conversation about the disease, parenthood, and overcoming fears. Actress, model, wife, mother, bibliophile — on 4th July 2018, another epithet, that of a cancer victim, got added to these when Sonali declared that she was diagnosed with high-grade cancer which had metastasized and that she was undergoing treatment for it at a facility in New York. For someone, whose life has been blessed with the riches of adulation, love, and wealth, such an experience can be a rude awakening, and it was no different for Sonali. Talking about her thought process post her diagnoses, Sonali explained how she spiralled into a bout of self-pity and despair. The brand of healthy and holistic living, of which she had been an enthusiastic endorser, seemed to have been a big lie. Questions of “Why me?” or “How can it be me?” bogged down the actress so much so that she sought the help of a psychiatrist to come to terms with her disease. But they say there is a light at the end of the tunnel and that tunnel came to an end soon enough for her. If you battle with a life-altering disease, you can’t fight that battle alone, you need reinforcements and that too in plenty. For Sonali, those reinforcements came in the form of her friends and her family, who gave her the strength and fortitude to undergo painful treatments without losing her spirit. Be it her friends, erstwhile actress Gauri Oberoi, and interior designer, Suzzane Khan, or her husband, producer Goldie Behl, Sonali was surrounded with love on all sides. Recognizing that this change affected her family as much as her, Sonali chose to involve her son, Ranveer in her journey by being truthful and honest with him. Talking about her approach to parenthood, Sonali said that the conversation regarding her disease with her son was very organic, and she made it a point to start her treatment in his presence so that he too could see it for what it was, just a disease. A great parenting approach, certainly. While outwardly, her journey had been about coming to terms with her disease and dealing with it, inwardly it has been one of self-realization and self-actualization. Not the one to sit in a corner, Sonali took a chance to make her disease an opportunity to become more fearless and pursue life with the wild abandon of a nomad. It also taught her to be more accepting of her body and revel in its evolving beauty. Being in an industry where one’s looks are their bread and butter, losing your signature luxuriant locks had to be soul-crushing, and it certainly was for her. But it also taught her to come to terms with it, and be a little kinder to her body and appreciate it for the miracles it performs. Rocking her short hair and posing for pictures, armed with replenishing hashtags such as #Onedayatatime and #Switchonthesunshine, Sonali has certainly owned her narrative, as is evident on her social media. While hers has been a transformative journey, it has life lessons for all of us. Maybe we all should take a page out of her book, and take our life one day at a time, and remember to switch on the sunshine when it all seems too overwhelming.